"World of Animals" and "World of People"
One of the biggest frustrations I’ve heard in the homeschooling world lately is that many parents struggle to assist their children in learning to write. It’s always been difficult to teach students to write well, but sometimes, just getting reluctant young writers to write at all is almost impossible. This isn’t just a homeschooling problem, as my experience in the public schools both as a student and as a teacher have proven. I’ve had numerous students who, when given a topic about which to write, just freeze. No matter how gentle and helpful the teacher may be, some students will become angry, or cry, or at best, just sit at their desk with a mournful look upon their faces and do nothing. 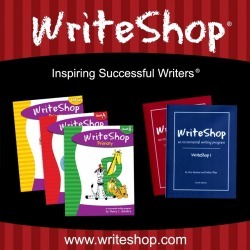 WriteShop (www.writeshop.com) is concerned about this fear of writing, especially in younger students in grades 1st through 3rd, so they have recently designed a new writing tool to be used with children. StoryBuilders is basically a deck of cards that contain words within a specific topic to be used as a gentle way to encourage children to enjoy writing. StoryBuilders is easily downloaded in an e-book format from the WriteShop website. After downloading, parents print off the various pages of cards that they want to use with their younger elementary aged children. For longevity’s sake, cards are better printed onto cardstock, but may be printed onto regular copy/print paper if desired. There are basically four categories of each StoryBuilders’ set: plot, setting, character, and character trait. Several ideas are provided on how to use the word cards. For our family, we turned them upside-down so the words didn’t show, and then we each drew a card from the deck that contained one word (from “World of People”). Next, we each began telling a made-up story that needed to contain the word that we selected. The story was told person by person, as we went around in a circle. Another way to use these cards would be to write a section of the story, piece by piece as it went around the circle of people. Or, each person could start a story with his or her word, everyone in the circle having a piece of paper, and then handing the paper to the person on his left, and continuing the previous person’s story, and so on, until the stories were all completed…and probably fairly silly in content! For the extremely reluctant or young writer, a story like this could be told orally and then recorded onto the computer or – gasp! – an old cassette player. Then, the story could be retold bit by bit, so that the student could type it out in a word processing program on the computer. My children love to write, especially if they are able to use the computer. One of my children finds it more difficult to write fictional stories, while the other finds it extremely hard to write non-fiction. If you know my children, then you will probably be able to easily guess which one is which! They found the WriteShop cards to be a bit stifling, just because they enjoy writing so much already. However, for reluctant writers, this could be an excellent tool to help children through “writing block syndrome”and help them begin to enjoy writing as a tool or for entertainment. This idea would have been quite helpful for numerous students I taught at the elementary grades in the public school system. Note: In our “All About People” card pack, the directions don’t say, “Option 1" and “Option 2" for printing, so a person who wasn’t familiar with the card pack could easily and accidentally print out two complete sets of cards containing identical words, but one set would be in black and white while the second set would be in color. That would be a shame, because it would waste card stock, ink, and the person’s time. Additional note: Kim from WriteShop contacted me this weekend to let me know that the wording on the printing directions for that particular set of cards will be rewritten to make it more clear for the purchasers of this product. Thank you, Kim! Wonderful customer service you have! DISCLOSURE: While I will never be paid to write a product review (gasp! ), I did accept a free copy of World of Animals and World of People for me to use in our home and then write an unbiased review.